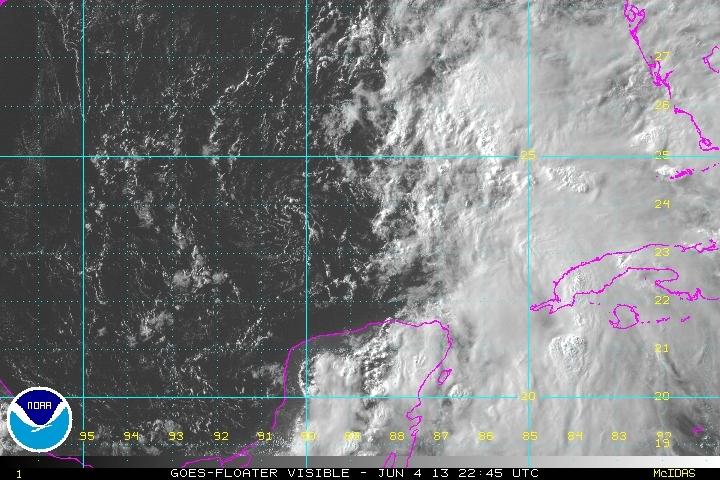 As you can see from one of today’s last visible images, the western side of 91L is very barren. Throughout the day a few spins in the lowest levels of the atmosphere have been noted in that barren air mass as they are spat out from what I believe will be the main center deep in the more moist thunderstorm activity. Shear continues to whisk all of the thunderstorms off toward the east and toward Florida. There seems to be a rather broad area of vorticity half embedded in the thunderstorms and half embedded in the drier air. This should begin to pull in entirely under the thunderstorms during the next 12 hours or so. 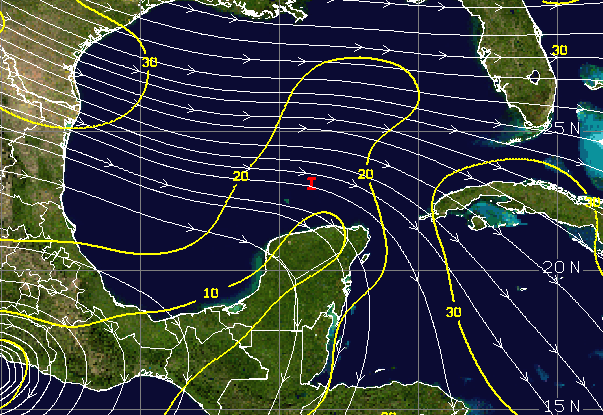 Wind Shear – Shear has come down in the most recent 6-9 hours as evidenced below in the 21Z analysis. This was not well forecast. We may see thunderstorms rebounding on the western side as soon as 2am if shear continues to relax. Shear is currently around 15 knots, which is marginally supportive for genesis. Upper level vorticity – The counterclockwise spin in the entire column of air over 91L has continued to be overbearing on any anticyclonic growth in the upper levels. Anticyclones (or high pressure areas) assist in the removal of air from tropical systems. A small low level inversion (hot air over cold air) is keeping a small lid on thunderstorm activity. Before I get to any forecast, I want to strongly highlight the threats with 91L over the next few days. 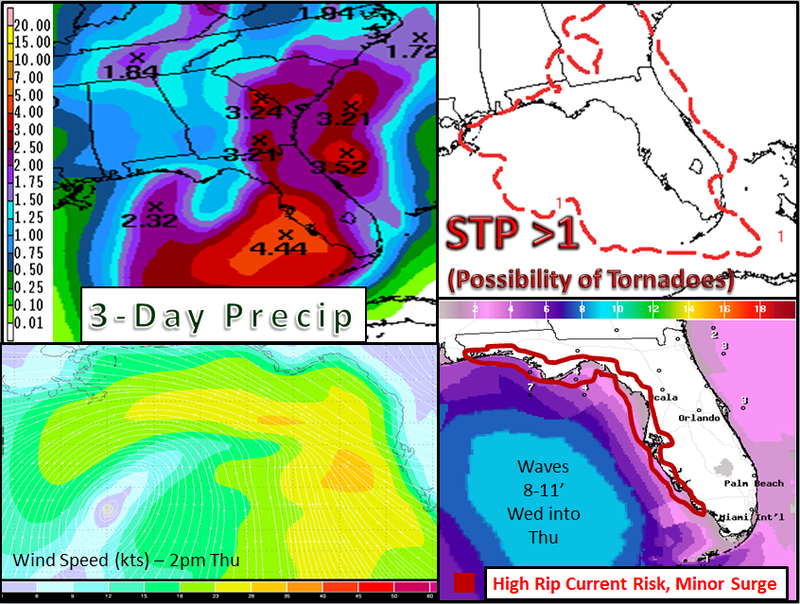 Tornadoes – The threat for tornadoes and waterspouts will increase along the west coast of Florida and the Big Bend Wednesday night into Thursday night. These will be short-lived and nothing like those we saw in Oklahoma last week, but they can still be deadly. If a warning is sounded, please move inside into an interior room. 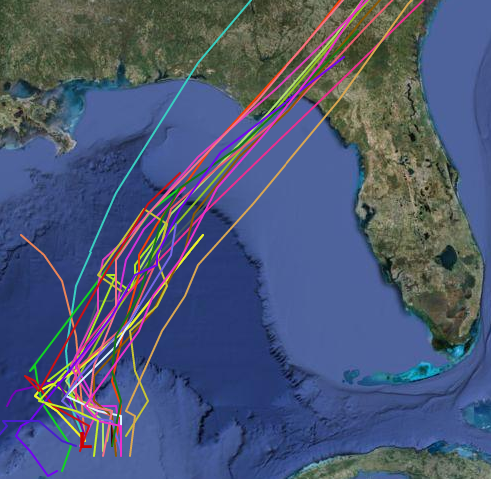 Marine – Waves will top 8 feet in the central gulf as 91L moves by on Wednesday and into Thursday. The rip current risk this week will be high. There will be some minor surge in the Big Bend to cope with especially during high tide. This is a good week to stay out of the water and away from the boat. This weekend will be better for all outdoor activities. The track is fairly well laid out with only minor differences on the coastline. I generally would not say that, however with this system and all of the shear that is involved, most of the weather will occur from the Big Bend southward without change unless something major happens in the next day or so. 91L will be moving ashore on Thursday during the PM hours, which is when many of the impact will begin to wane. This part of the forecast entirely depends on what happens tonight. Overnight tonight there is a window for enhanced growth as shear wanes, dry air begins to erode, and the upper level trough that will pull 91L northward stays away. I could still see a minor tropical storm coming from this system, but the odd are for the system to remain weak as a tropical depression. If there is a day for a renumber to TD 1 it is tomorrow. Expect a gusty end of the week either way. Posted on Tuesday, June 4th, 2013, in Florida Weather, Tropical Weather. Bookmark the permalink. Leave a comment.